Design strategy and marketing agency Zeus Jones was recently hired to bring a fresh perspective to Purina ONE BeyOnd’s sponsorship of the Pitchfork Music festival. 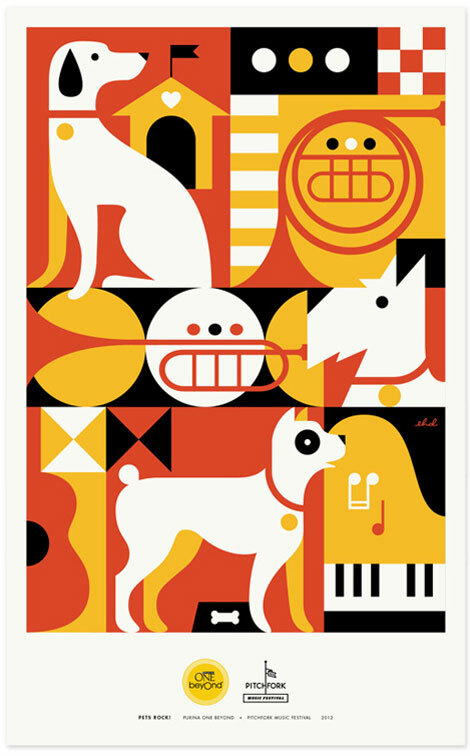 For this year’s event they came up with the idea of giving away professionally-designed posters that celebrate the awesomeness of pets and music. Zeus Jones sought out some of their favorite designers and had them imagine what “Pets Rock” meant to them. Check out the following from grain edit faves – Lab Partners, Brent Couchman, Tad Carpenter and Eight Hour Day.